I haven’t been blogging lately because of a little ol’ dissertation that I’ll be finishing up next week—but this story is so good that it needs to be shared while it’s still fresh. Throughout my dissertation, I use tons of epigraphs at the beginning of chapters and sections. This makes sense, because when someone has read so much stuff on his topic, he’s got to use all those awesome quotations somewhere, and it would be bulky and annoying to fold them all into the main body. But for the introduction to the whole diss, I wanted to use a musical epigraph—a one-minute clip of instrumental music that would do the same things epigraphs usually do: whet the appetite for the upcoming content, surprise the reader a bit, poetically or subtly hint at information to be more didactically expounded upon later. This echoes my argument through the diss for more emphasis on sounds themselves, not sounds-as-explained-in-words or sounds-as-symbolized-on-paper. For this musical epigraph, I chose to use a minute at the beginning of Richard Strauss’s Till Eulenspiegel’s Merry Pranks (for lots of reasons that I won’t go into here; just read the dissertation if you want to know). Happily, I found a copy of a recording that Strauss himself had conducted for a 1931 78 RPM recording, which the good folks at archive.org had digitized and shared online here. 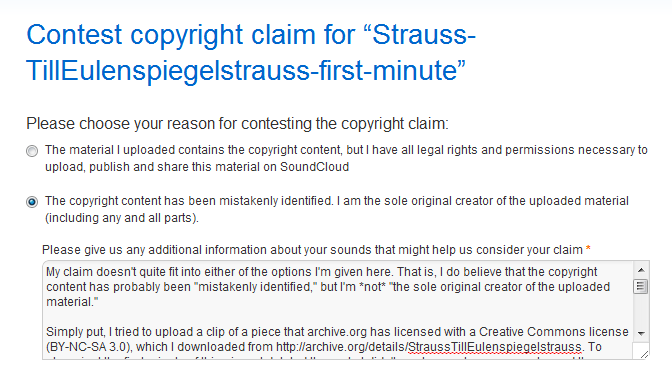 They gave it a Creative Commons BY-NC-SA 3.0 license, meaning that users may legally download this, remix it in any way, and reshare it how they choose, as long as they 1) attribute the work (probably both to Strauss and to the archive.org people who digitized it? ), 2) don’t make money from this re-sharing, and 3) use the same CC license when resharing. So I took the mp3, used Audacity to cut out the first minute, and uploaded it to SoundCloud. (I admit that in my rush, I didn’t check to make sure I was “share aliking” the exact Creative Commons license in the options on SoundCloud, something I figured I would do later. This was definitely my bad—but I was writing some awesome stuff right then and didn’t want to pause.) I wanted to insert a link to this online audio file in the text of my dissertation’s introduction, which seemed a better idea than linking to the whole fourteen-minute piece hosted on archive.org or embedding the file into the Word Doc (which is possible, but I didn’t know how it would translate to different word processors or if it would survive a translation into pdf). But SoundCloud stopped me in mid-upload. The sounds matched copyrighted material, they said, so I couldn’t upload it. They gave me the option of contesting the claim, which I did, but they certainly tried to scare me out of it, saying that I was risking future legal trouble, the revocation of my SoundCloud account, and so on. It was definitely big, scary, legal language designed (it seemed) to convince me not to contest the thing at all, to just move on and live a happily timid life where all copyrighted material was STAYED AWAY FROM for all time. 2) Archive.org mistakenly gave this CC license to material that they didn’t have the right to share in this way. If that’s the case, I apologize for trying to upload this copyrighted material to SoundCloud and I take back this request to put it up. I’ll report here what happens, if anything. As you can probably tell, I’m feeling a little pushed around, but also fairly respectful. That is, there are inevitably defensive emotions that come up when it’s implied that you’re a criminal when you don’t think you are, and I’m still trying to wrap my head/heart around the exact nature of those emotions. But on the other hand, I do support SoundCloud’s decision to use auto-detection technology to keep copyrighted material off their site, and I do support their decision to give me space to explain myself. But still, I can’t help but wonder how much people restrict their fair use activities because of this kind of thing. I hate the idea of creative folks wanting to make amazing remixes that exercise their very legal fair use rights, only to shut themselves up out of fear of being bullied. Sigh? Great post, Kyle. I recently had a similar experience with YouTube (I took screenshots as well for a future blog post I haven’t gotten to yet–ha!) and the process looks to be nearly identical. What struck me most is the final step. We are asked to act in “good faith,” rhetorically reinforcing (re-enforcing) notions of guilt and morality as somehow central to intellectual property/copyright; that it is a sin, a holy transgression that must be paid for not with proof or material exchange, but with faith. I found it to be most interesting. Anyway, thanks for the thoughts, see you soon in NC. I just want to say I wholeheartedly agree with your article. I for one make stuff for Soundcloud myself. I enjoy how easy it is to navigate the website to find the stuff I like. It is a great platform, but the main issue I and a lot of other creators have with it is the copyright system. 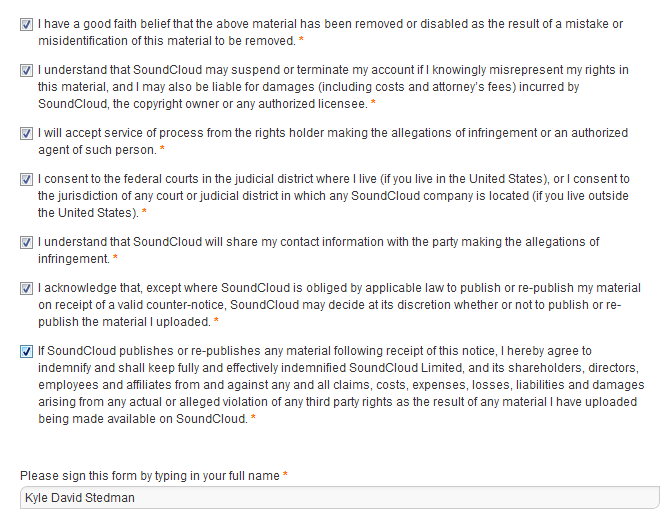 In short, Soundcloud seems to not care about fair use and treats its users like dirt when it comes to copyright issues. I have had 2 tracks taken down for copyright: one from supposedly Sony themselves and one by the stupid automation system. For my second claim, I copy and pasted the exact text of the Copyright Act where it addresses fair use followed by me describing why my track was indeed fair use, calling out Soundcloud for not regarding the law, and how I saw myself as a creator on their website. Apparently, the one guy who is in charge of all the disputes (seems like one guy is in charge of it) got butthurt over me saying Soundcloud doesn’t follow the law, so my dispute was rejected. Don’t get me wrong; I love Soundcloud as a website. As a company, though, I see them as lazy, non-caring, and disrespectful to the users of their website.